Here’s Kohli from yesterday. The hands will do what Buttler’s hands do. There’s the ‘L’ shape that produces the ‘lag’. The hands travel across his body // to the ground as the sequence continues. the ball has reached the point below the hands, but there’s still plenty of room for the lag to unwind, creating tremendous bat speed. Hands still at the same height as the first image – ‘low’ relative to the ball – a shallow angle of attack. Hands in front of the ball. Still some lag to be unwound. And the shallow angle of attack. There are many similarities here with a Jordan Spieth drive. Those able to watch the first ODI match between India and England played at Pune yesterday were able to feast on a diet of 750 runs, without the slightest fear of indigestion. It was a great spectacle. It was also a funny old wicket. Few batsman managed a decent pull shot, which suggested variable pace, there were a few dabs and flicks but surely most of the runs came from drives or was it just the stunning nature of these shots – especially from Kholi and Buttler – that gave a false impression? And this revealed a delightful irony of the modern game: with all the new shots that have come into cricket in the last decade; reverses, ramps and switches; it is actually the good old drive that seems to have undergone the greatest transformation. People point to the bats, and yes, they are softly pressed and the willow more evenly dispersed across the blade, but they are not unduly ‘heavy’ or heavier than those used in the 1970s. Where then comes the increased range of the lofted drive, especially, and the increased pace at which the ball comes off the blade? 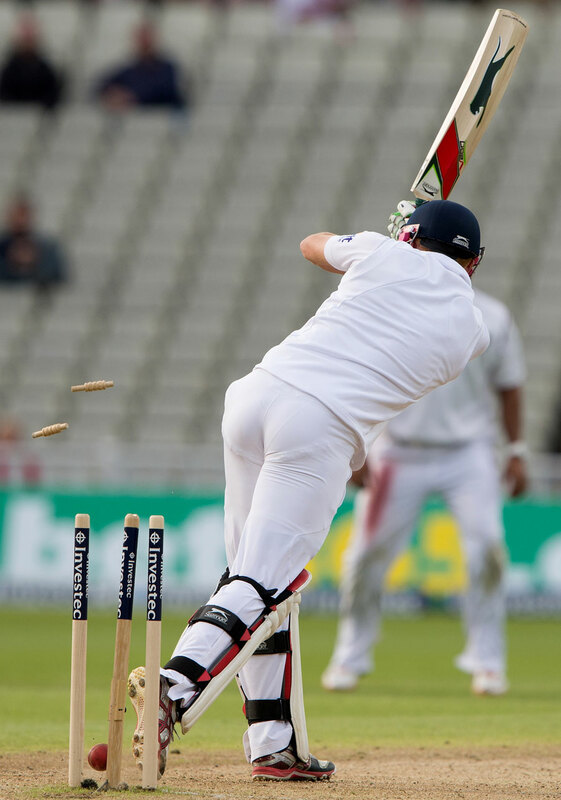 Above is an image of Buttler that reveals all. Ask any American weekend golfer what’s going on and they’ll tell you. But how many cricketers? It’s an ‘L’ of a shot. It’s August and the Squire is on his Bowland estate. It had been raining incessantly on the moors. Abrasion and grip can produce enthralling, skillful cricket, with batsman challenged by and responding early in the match to conventional swing and seam, and later to reverse swing and spin. Cricket at Formby began on a day five wicket, as dry and textured as Third Man’s bowl of Flahavan’s porridge oats. Cockbain turned to Parry and Keedy in the 9th and 10th overs. Parry, initially stiff and wayward to leg after a fortnight out of the Lancashire side, and Keedy, feeling his way towards the optimum pace at which to bowl. Early doors, both experienced the indignity for left-armers of being lapped by right-handers. But old pros like Pazza and Gazza are not put off by that, even when New Brighton’s 50 had arrived with no further loss of wicket. Then Parry, who bowls straighter and quicker than Keedy, hit the stumps. And Keedy, tossing the ball high and ripping it across the face of the bat, found the edge. Here on view were two very different approaches to the art of left arm bowling: Keedy intimidating the amateur batsmen with prodigious turn and bounce before striking with an arm ball or a delivery of less excessive flight and turn; whilst Parry bowled bullet straight. Four LBWs, two for each on a ‘Bunsen’. A good partnership for the ninth wicket, with some fearless hitting, transferred the pressure from batsman to bowler and took the New Brighton score to a very respectable 165 all out – Parry 5 for 44, Keedy 4 for 68 – “More than we planned for,” said Cockburn. There is no such thing as a ‘natural’ wicket – not even a terroir – when there is marl or loam, or even dust to be added; watering and covering or uncovering to be varied, length and extent or absence of grass to be gauged, and, on first class grounds, heaters and varying rollers to be chosen. Every strip is a contrivance: In the first Test between England and Pakistan this summer, the public were provided with conditions that entertained them with the excitement of late movement from reverse swing and the ingenuity of classic wrist spin. Old Trafford contrived to avoid the conditions of the previous Test, and Edgbaston provided the drama of attrition and brought forward the narrative of perseverance overcoming the odds. Formby had contrived conditions that Boycott would have enjoyed; conditions in which batsman, in the highest level below county cricket, had to battle with flight and turn and fierce bounce not from pace but from the spinner’s science – the keeper often taking the ball above shoulder height standing up. And New Brighton had three spinners in their armoury who could and would monopolise their bowling. The Formby openers refused to allow these three to settle and took the score to 100 without loss. But once those spinners had tasted success, the scales moved against Formby with three wickets falling without the score moving on. In a blink it was 125 for 5 and 144 for 6 before Cockbain, with years of experience, sent out two lefties to neutralise the two left-armers. This is as good as cricket gets – spinners bowling 87% of the overs in helpful conditions. Metaphorically and literally gripping stuff. These conditions can be contrived anywhere in the country at almost any time of the season. Don’t be fooled into believing that seaming tracks are God given, they are not. More ‘Bunsen burners’ will see counties and England Test sides bringing on and using the spin talents that dominate Under 11 and under 12 county cricket. Tomorrow England face Pakistan at Old Trafford. Expect a feast of bowling. At Lord’s, the Pakistan seamers were getting it to reverse almost by the twenty over mark. At that rate, if the OT wicket is typically abrasive, they’ll be getting it to reverse after five! But the highlight will surely be the chance to watch Yasir Shah again, following his 10 – 141 in NW8. Viewing Shah from side-on you’ll appreciate the speed of the arm and the powerful force he generates through the crease, like a catapult assisted jet taking-off from an aircraft carrier. In the first innings he exploited the minimal turn offered by the wicket. Throughout both innings he was content selflessly to bowl from which ever end his seamers didn’t want to bowl from and made the best of it whenever that required him to bowl his leg-breaks up the slope: a good team player for an obvious super star. Also he took a number of wickets when England batsmen played vicious top spin deliveries square to leg instead of bunting them straight back. Was this faulty technique? Well of course. But it wasn’t as simple as that. Every now and then … perhaps once every four overs … Shah, as if in error, would drag down a delivery which a grateful England batsmen would gleefully pull to the mid-wicket boundary. But it was like watching a fisherman dangling some rubby dubby over the side. Except that to understand why Bairstow played the ball as if it was a drag down ball and not the top spinner that was going to screech through anything but a straight bat, you have to have seen that Shah had deliberately given him just such a dragged down delivery to ‘whack’ to the boundary four of his overs before. HT the ever suspicious Chris @ Declaration Game and Brian Carpenter @ Different Shades of Green. The Squire and his factotum, the ever-obliging Third Man, made their way to Bath this weekend. The Squire was keen to lend his name and good lordship, to a campaign against Bath and North East Somerset Council’s intention to charge admission to the Victoria Art Gallery. Their signatures added to the petition, the travellers took advantage of free entrance into the first museum show for 22 years of one of the UK’s major photographers, Roger Mayne. 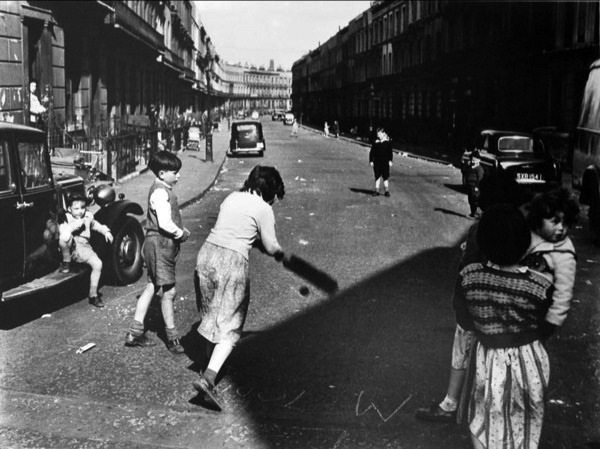 The image above, was taken in Addison Place, North Kensington, London, W11, 1956. “Do you think Mayne appreciated the serendipity of capturing a sweep shot against the background of the sweep shop?” mused the Squire. A post card of a very particular young man; neat of sock, precise of grip, full of concentration, brought to mind ‘Hope of His Side’. 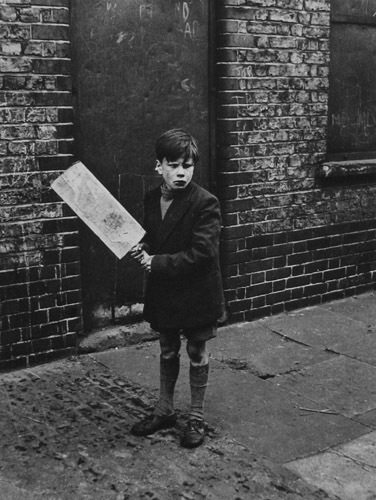 The reverse of the card identifies it as ‘Boy with a Bat, Wapping. 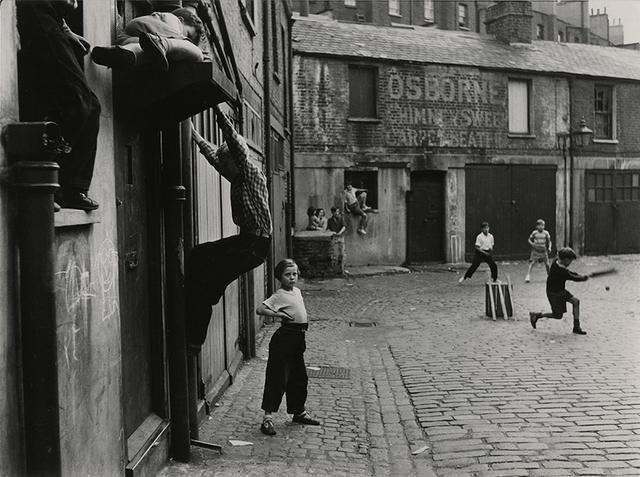 1959’, but the website suggests it was taken in Addison Place, again, in 1957. And here is a very modern shot in both senses. It is taken in Clarendon Crescent W2, just before its demolition in a slum clearance scheme. A year or two earlier it had featured as a setting for a car chase in The Blue Lamp. And finally, an image that begins to do justice to the mastery of the exposure of the prints on show; fielders awaiting a sky-er. Look down you Jilted Generation on these baby-boomers. * H.T. 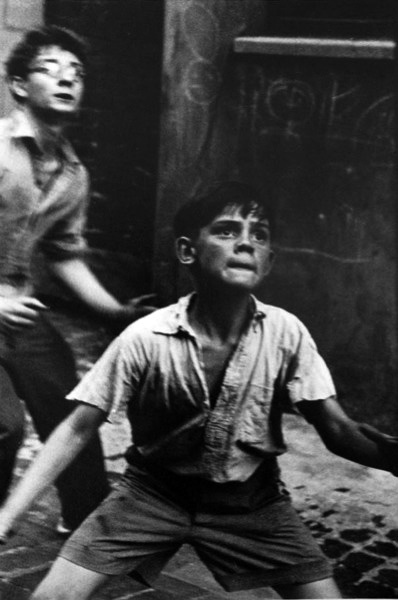 Cartier-Bresson who in his book Images à la sauvette quoted the agitator Cardinal Retz, “There is nothing in this world that does not have a decisive moment”. A catalogue with an essay by Ann Jellicoe is available with the exhibition (£6.50 plus p&p) and there are ‘vintage’ prints for sale. It is nearly a year and a half since the last Compare the Drives looked at A.A. (Archie) Jackson and Usman Khawaja. 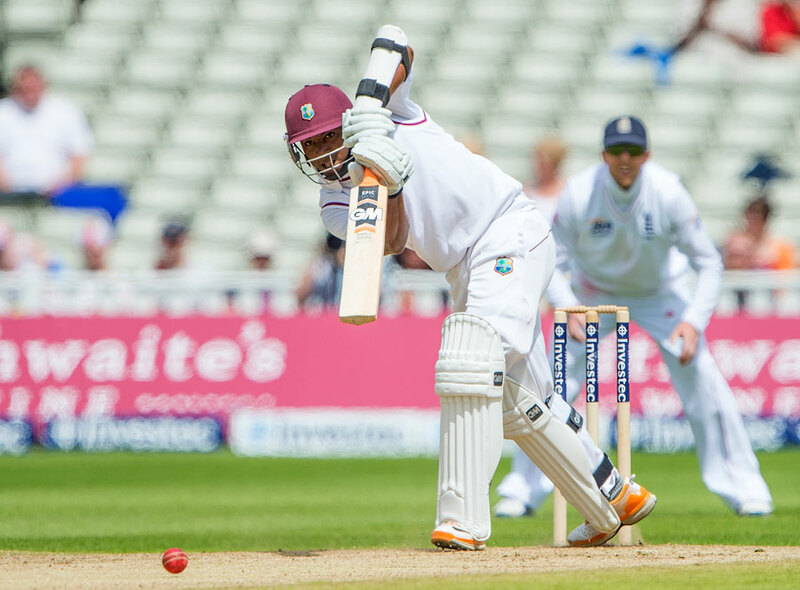 Yesteday the West Indies’ Number 11 scored a record breaking 95 and Jonny Bairstow sadly unable to break free from the fate identified here and associated with a certain kind of modern batting was bowled for 18. Recalling to mind the ol’ Chuck Berry classic.